East St. Louis, IL (KSDK) – NewsChannel 5 has learned that the former head of the East St. Louis Police Department pleaded guilty in federal court Thursday morning. Michael Baxton Sr. stepped down as police chief Wednesday afternoon, citing personal reasons at the time. He pleaded guilty to felony charges of stealing evidence and making false statements to federal investigators. Baxton, 49, posted bond later in the day and is awaiting sentencing, set for April 27. In May 2011, Baxton was hired by the Village of Alorton to serve as the police chief. 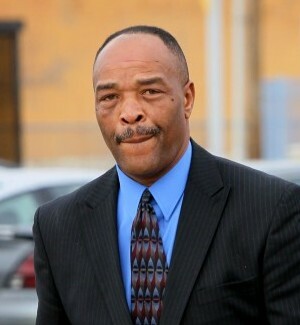 The previous Alorton police chief, Robert Cummings, pleaded guilty to unrelated federal tax crimes. Baxton served as Alorton police chief until October 14, 2011, when state authorities decertified Baxton as a police officer after discovering he had at one time received two felony convictions from 1982. On November 17, 2011, a St. Clair County judge reinstated Baxton’s law enforcement credentials. Shortly after being reinstated, Baxton was hired to be the next police chief of East St. Louis, a position her served in from November 30, 2011 to January 18, 2012. Baxton resigned as part of his plea agreement to the charges against him. Meanwhile, a federal investigation was underway into allegations of corruption within the Village of Alorton by various public officials. In the months following Baxton’s appointment as police chief, several officers in the Alorton Police Department complained to federal investigators that Baxton showed favorable treatment to arrestees who were family members or associates of certain Alorton residents or of Baxton himself. Officers further accused Baxton of failing to send evidence to the Illinois State Police crime lab for testing, or of stealing evidence fron the secured evidence room within the chief’s office. Federal agents arranged an undercover sting operation against Baxton. They abandoned a federally-owned covert vehicle and reported it stolen, registered to a fictitious Illinois business. Baxton and another officer, working with the FBI in an undercover capacity, responded to the call of an abandoned vehicle. They found five Xbox 360 video game consoles inside the car. Baxton took four of the consoles and told the other officer to take the fifth one for himself. Agents with the IRS and FBI interviewed Baxton on January 5. He denied ever taking anything while working as a police officer. At one point, Baxton blamed another officer for the theft, saying that officer took all the devices. When confronted with evidence that authorities knew he took the devices, Baxton apologized and assisted in recovering the four consoles he stole. Baxton faces up to 10 years imprisonment, a $250,000 fine and three years of supervised release on the theft of government property charge. The crime of making a false statement to a federal law enforcement officer is punishable by up to five years in prison, a $250,000 fine and three years of supervised release.